Stress. Failure. Loneliness. We are all facing similar obstacles in an overly busy, sometimes lonely, always challenging world. 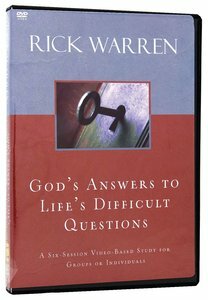 In this 6-session group study DVD - God's Answers to Life's Difficult Questions - pastor and bestselling author Rick Warren helps you find the simple, straightforward answers in ancient Scripture that lead to purpose, peace, and a life of significance...starting today. About "God's Answers to Life's Difficult Questions (Dvd)"